Traditional potato puree is not only generously flavored with oil and seasonings, but also add milk or cream. If you for some reason want to do without cow's milk, it does not mean that you have to exclude from the menu and mashed potatoes. Depending on the reasons you decided to avoid milk, there are different alternatives. For example, if you are going to add it to mashed potatoes due to dietary or medical restrictions or because you decided to become a vegetarian replacement for animal milk can be a vegetable. Soy, rice, coconut and almond milk is ideal for people suffering from lactose intolerance and vegans. For mashing these replace cow's milk in the ratio of 1 to 1, but instead fatty flavored butter take a dairy-free margarine or vegetable fats. 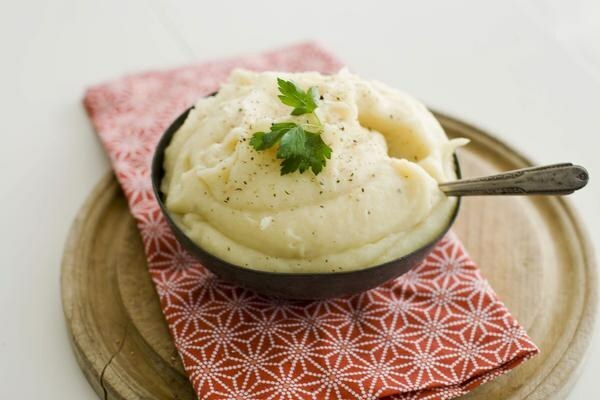 When choosing a plant milk for mashed potatoes, avoid sweetened products. For those who avoid cow's milk due to the fact that a diet low in fat, it is recommended to replace it with chicken or a rich vegetable broth. If you have a home just wasn't no milk, no butter, but happen to have a fatty ( 20%) cream, remember that the glass they will replace you the same amount of milk and 1 tablespoon oil. If all dairy products you only have whey, it is also suitable for mashing. Wash the potatoes thoroughly under running water, peel and cut into cubes the same size. Rinse them again. Put the potatoes in a saucepan, add the peeled garlic cloves and pour in the broth. Bring to the boil and simmer until potatoes are soft. Drain the broth in a separate bowl, remove the garlic. Mash the potatoes with colocoscopy or run through a press, gradually pour the broth, ensuring a homogenous, fluffy mass. Put the vegetable oil and season the puree with salt and pepper to taste. If you want to cook mashed potatoes without salt, add dried dill, gives the dish a salty flavor. The trick of cooking this sauce is that potatoes steamed. Thus, avoiding direct contact with the boiling water, the potatoes fall apart, but the cells of the starch in it are not destroyed. Wash, peel, rinse and dry the potatoes. Cut it into equal slices and place in the bowl of a double boiler on the bottom, pour 2 cups hot water, bring to the boil, cover and cook steamed for about 20-30 minutes until fully cooked. Slightly cool the potatoes, skip through the press or preroute special fixture, and season with butter, salt and serve.